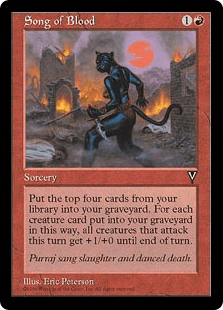 Put the top four cards from your library into your graveyard. For each creature card put into your graveyard in this way, all creatures that attack this turn get +1/+0 until end of turn. Purraj sang slaughter and danced death.